Who is this crazy fan femme, and how did she get to be so obsessed with Don Karnage? Both good questions! Well, my name in what passes for real life for me is Katie Sullivan. I'm a 2003 college graduate (English major) living in Wisconsin, USA. Besides Disney comics and animation, my interests include aquariums, sci-fi and fantasy, post card collecting, literature, cryptozoology, and lots of other random stuff. For more than you ever wanted to know about me, see my full bio here. For Spinnish stuff, read on. For what it's worth, however, there is a connection between Scrooge and Don Karnage. One of the foremost duck comic artists/writers in the world today, Don Rosa, also wrote two episodes of TaleSpin: "It Came From Beneath the Sea Duck" and "I Only Have Ice For You," both of which feature Karnage. "How dare she like you more, you silly rich duck-type-person!" This page was originally titled "The Iron Vulture: My TaleSpin Art." However, in case you haven't noticed, there are at least three other DK sites out there with "Iron Vulture" names. So as the page grew to include more than just art, I changed the name to "Pirate Island." In the beginning, there were less than six pictures here, and one super short little fanfic called "The Heir", about the birth of Juan. That little ficlet was totally different from "Splitting Heirs." None of that original content is here now. The art was old and horrible, and the fic wasn't much to write home about, either. How did the character Scarlet come to be? Well, she's physically based on Muffy Vanderschmere. See, back in 6th grade, when TaleSpin first came out, I wrote part of a horrible fanfic about Don Karnage and his twin sister, Phyllis o_0 wherein he was married to Muffy. Don't ask me what I was on! Anyway, when I revived my obsession in more recent times, I took the basic look of Muffy, made her much wenchier, played around with her fox markings a bit, and came up with the Scarlet vixen you see today. Please note that Scarlet is not supposed to be a furry version of me! She's just one of many fictional characters created for my fanfics. 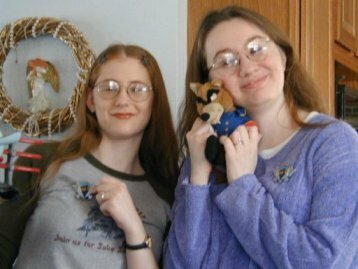 The red-haired vixen sister of Scarlet is based heavily on my RL best friend, Kayleen. Visit her page for more about her and her fabulous art. Katarina the vixen is more dishonest than her human counterpart, but her fiery, sarcastic yet loyal personality is the same.